This entry was posted on 03/05/2013 by sommecourt. 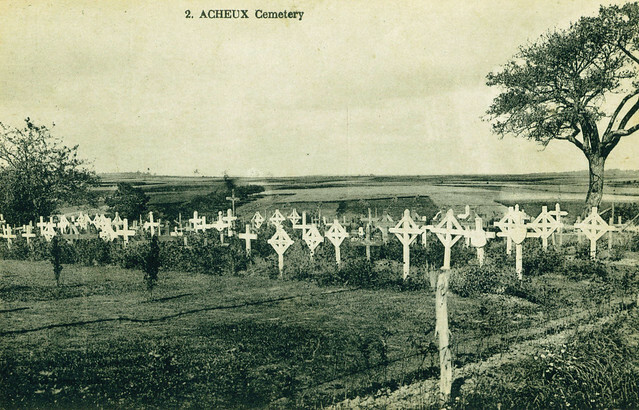 It was filed under Aftermath, Battlefields, France, Great War, Somme, War Cemetery, Western Front, WW1 and was tagged with 1920, Acheux, Aftermath, Silent Cities, Somme, War Cemetery, War Graves, WW1. Hello Paul May please I ask for you advice? I am trying to write a bit of a history of the Rhodesians on the Western Front. This all started when my family found a diary of my Grandfather who was with the 2nd KRRC – Rhodesia Platoon. It was you who kindly put me right in regard to where it was that he was wounded on the night of 30th June 1916. You also mentioned that I should read Eyre’s book (Somme Harvest) which covered the Triangle Diversion at Loos on that night. Its an excellent read. All this occurred through the Great War Forum. In 2010, whist making a visit to the UK, I was going to try to find location of the Triangle in relation the Double Crassier. I think I found it but I need to somehow way of clarifying the precise position. I have not only written about the exploits of the 2ndKRRC but also the 1st SA Infantry Brigade since my great great Uncle was a staff officer with the that unit. Having said all this the advice I am seeking is how I might find images and maps of both men and their battles? I am so impressed with what I have seen coming through you blog. In fact one of your photographs,Trenches In The Sand: One End of the Western�Front shows the condition of defences of what was left of 2ndKRRC’s (I think) trenches pretty soon after the battalion was annihilated on 10th July 1917. It made the little that I know of that day come very much alive for me. May I therefore ask if you might indicate how I might go about finding such photos? I spent 4days at the IWM but came away with only half a dozen photos. Some of which were not directly related to the KRRC. I found nothing on the 1st SAI so assume those may be with the Military Archives in Pretoria. I visited the Zimbabwe National Archives and was able to locate some good photos of the 1st Rhodesia Regiment in GSWA (my Grandfather was a member of that unit). Unfortunately the staff had no means of making prints of the photos since they have no funds for purchasing either paper or printing materials. At the time these could not be procured in the country anyway! Anyway my apologies for having had you read in a round about way, what I am seeking. Perhaps you might give me the benefit of your knowledge as to my issues. Obviously I realise this is how you make your living and so I understand that there will be a cost associated with helping me. I will willingly pay for your services. Hi Mike – if you go to the About page you’ll see an email link. Drop me an email and we can take it from there.